AHEAD, a leading provider of IT consulting and enterprise cloud solutions, recently announced it has achieved the VMware Cloud on AWS Solution Competency, allowing the company to offer VMware Cloud on AWS to its customers. AHEAD is one of the first solution providers to offer VMware Cloud on AWS and receive the VMware Cloud on AWS Solution Competency, making them uniquely positioned to help its clients take advantage of VMware Cloud on AWS. To learn more, I spoke with Matt Johnson, the company's Engineering Manager. VMblog: If you wouldn't mind, please provide VMblog readers with a brief overview of the VMware Cloud on AWS announcement. Matt Johnson: The General Availability of VMware Cloud on AWS (VMC) is the culmination of a development effort between VMware, AWS and their strategic partners, bringing the features, functionality and familiarity of VMware's Software-Defined Data Center (SDDC) to the AWS public cloud. VMC on AWS facilitates the use of vSphere on next-generation AWS infrastructure, enabling users to seamlessly migrate existing applications, develop entirely new applications and extend the capacity of current data centers quickly. This removes one more roadblock from our clients' journey to the Enterprise Cloud. VMC on AWS also provides access to a wide range of innovative AWS services including compute, databases, analytics, Internet of Things (IoT), security, mobile, application services and more. VMblog: And what exactly do you consider the "Enterprise Cloud"? Johnson: The Enterprise Cloud is, to put it simply, whatever the customer's desired and needed end state is. Many people use the term "hybrid cloud", but that's an oversimplification, as it simply talks about the private and public "clouds" rather than the critical stitching between those infrastructures, including: security; enterprise service management; application dependency mapping (ADM), performance monitoring (APM) and migration; DevOps; critical networking, data protection, colocation and storage considerations; and the financial planning, investment and management. This will allow clients to invest in their Enterprise Cloud by creating a cohesive and holistic strategy, roadmap, design and plan. We created an Enterprise Cloud Delivery Framework to help strike those balances at all levels-from infrastructure, to security, to the right tooling for application and infrastructure deployment, to the automation and orchestration that helps coordinate it all. We apply this framework in our work with clients because it captures the technical, operational and organizational imperatives necessary for success at all levels. VMblog: What does this mean for enterprises? Johnson: In the near term, VMC on AWS can be used for DRaaS and DevOps, though both need to be entered into with careful planning and execution. In the close future roadmap, VMC on AWS will allow customers with massive investment in one or more application stacks to enter the Enterprise Cloud without a total and complete refactoring effort that could cost millions of dollars and take years to complete. This will give enterprises the time they need to make the financial and operational decision to either retain the application in VMware or to refactor and migrate, while not being bottlenecked on their journey to the Enterprise Cloud. Some other popular use cases for VMC on AWS include data center extension to satisfy cyclical capacity, extend to new geographies, or enable new application development and testing. VMblog: What kind of benefits does this announcement bring for customers/clients? Johnson: VMC on AWS takes best-in-breed VMware technologies across compute (vSphere), storage (VMware vSAN), and networking (VMware NSX), which are all optimized to run on next-generation, elastic, bare metal AWS infrastructure. The simple and consistent operations will allow our clients to rapidly provision and scale AWS resources on-demand, and it offers workload portability across clouds without a lot of complex or time-consuming application re-platforming. An added bonus for clients is that it won't require staff retraining since it runs on tools that vSphere admins already know. There are a ton of benefits to clients and customers of all levels who are currently using VMware to utilize it for Disaster Recovery as a Service (DRaaS) or for their DevOps environment. As additional capabilities and cost models are developed, I anticipate that the potential use cases will grow at the same pace. VMblog: How does this announcement help customers who are running Enterprise strategies? Johnson: VMC on AWS was designed for the Enterprise in mind. Customers who are already on their journey to the Enterprise Cloud will be able to identify workloads or applications that would be ideal candidates for an AWS use case that might be too time-consuming, costly, or difficult to engage otherwise. The regional capacity will allow Enterprises to easily deploy VMware SDDC into their choice of AWS Cloud regions over time, so they won't need to wait long cycles for hardware procurement and configuration. It will also ease the migration of application workloads from on-premises to VMC on AWS without converting machine images or re-architecting applications. Businesses will also be able to deliver VMware SDDC-consistent test/dev environments and have the ability to integrate with the modern CI/CD automation tools on the market today. You can also spin up incremental capacity to handle seasonal or project-specific needs on an on-demand basis. Lastly, DRaaS is a fantastic option for clients already using VMware for production and for Disaster Recovery strategies using VMware Cloud Site Recovery, which is a function of Site Recovery Manager. This is a huge deal. VMblog: Explain if you would why Site Recovery on VMC is such a big deal. Johnson: Let's say you're using VMware in your data center and VMC on AWS. You've installed and configured SRM, including Site Recovery on VMC. You are now protecting your virtualized workloads in your Enterprise Cloud with an on-demand recovery solution not only between your private and public cloud, but between different instances of VMC on AWS. These tools are invaluable when it comes to operations management, automation, governance and mass migrations. Planning for business continuity is essential, and this just simplifies delivery. It will allow you the ability to easily prepare for potential disruptions, which will minimize long-term effects on the company. VMblog: What do you need to do in order to use VMC? Johnson: The first thing you need to to is get to 6.5. This is an upgrade that needs careful planning and execution, especially if there are pre 6.0 workloads in your environment. AHEAD has put together a VMware 6.5 Upgrade Readiness Assessment service that can help clients to identify any potential gaps, roadblocks, or potential dangers on their path to VMware 6.5. After that, for the current DRaaS option or the future full application migration, it's a matter of ADM, APM and workload analysis to ensure a seamless transition of full and smooth failover and failback of production application stacks in the event of an outage. Sound financial planning is also necessary to make sure that DevOps workloads will be tightly managed and cost-effective in the cloud. VMblog: Can any Enterprise Cloud solutions company provide this service? Johnson: There are many other organizations that focus solely on datacenter infrastructure, Cloud, ESM, or Security, but AHEAD's belief is that a true Enterprise Cloud can't be successfully realized unless these silos are broken down and stitched together conceptually and operationally. AHEAD's consulting and services methodology ensure that all of the right teams are in the mix to drive collaboration on the client side, as well. AHEAD is at the very top of the game with its process and execution, integrating technical, logistical and financial strategy, roadmap, design, and plan consulting services. We employ a comprehensive approach to ensure the proper foundation for your environment. In addition, our long and trusted partnership with VMware, which has resulted in achieving the VMware Cloud on AWS Solution Competency, has enabled us to be uniquely positioned to help clients with this integration. VMblog: What use cases might fall under DevOps right now? 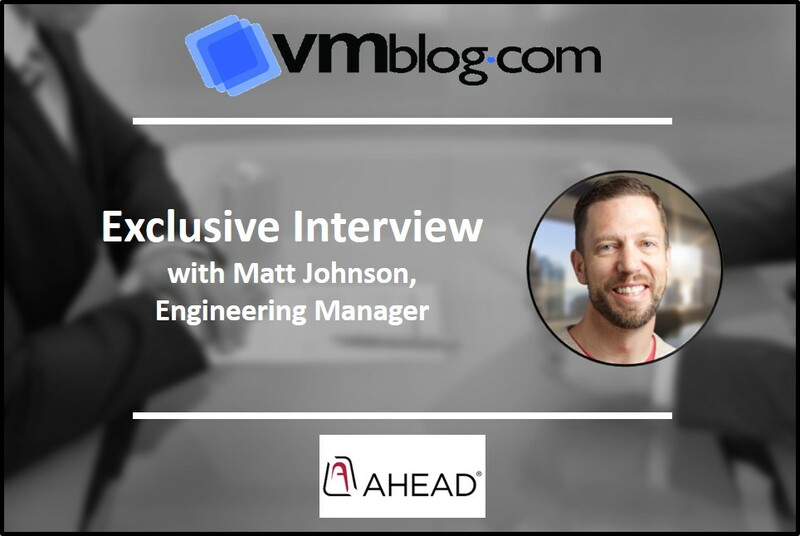 Johnson: With careful planning and management, clients can drive successful new app development, integrated seamlessly into native AWS services and CI/CD automation tools and processes, delivering the same consistent dev/test environment they use in VMware's SDDC now. Integration with AWS CloudFormation and Hashicorp Terraform enable customers to automate SDDC-level provisioning using popular and familiar DevOps tools. VMware is also introducing developer center, which is integrated into the VMC on AWS service console and offers automation experts, DevOps engineers and developers a central portal to gain access to detailed API information, software development kits, code samples and command line interfaces. VMblog: Any other considerations to keep in mind? Johnson: There are definitely a few things to keep in mind when considering an Enterprise Cloud strategy. For instance, you'll need to avoid creating a new cloud silo, as divergent IT systems can result in trapped information. This poses several risks for businesses, such as issues with billing and revenue management and difficulty accessing data in a timely manner. Ensuring operational consistency and simplicity is another factor here. This will prevent your team from acquiring an immense operational burden while implementing new upgrades. Furthermore, you'll need to be certain of compatibility with applications between on and off-prem environments. Without this compatibility, you're at risk for issues with data and workload migration, networking, security and storage. These considerations are quite hefty to manage on your own, which is why AHEAD is here to help lessen the burden. I'd also like to reiterate some key points here. VMware Cloud on AWS brings all of the benefits of VMware to AWS, but-as with any other new technology solution-it needs to be well-planned, designed, executed and managed. To use VMC on AWS, you need to be at version 6.5, and to be successful with that, careful analysis and best practice process definition and management are critical and crucial.